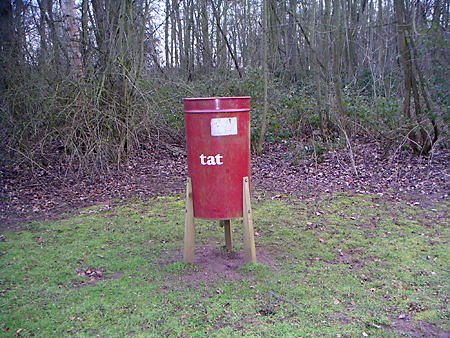 The tat-bin was spotted just inside the gates of Grimston Park, Nr. Tadcaster on Saturday 17th Feb. ”¦ We have no idea what the bin is meant to collect, as it was on a grass verge and a long way from the residential areas of the park. SLAB is especially intrigued by the rudimentary rocket-fin wooden legs, and the self confident use of lower-case Cooper Black lettering. Thanks to ZoÃ« and Ewan.